The Harrogate quilt festivals are my local shows and it's always nice to see so many familiar faces. I had a lovely time last weekend at this 3-day event, though I think it was warmer outside than in the hall - always the way! 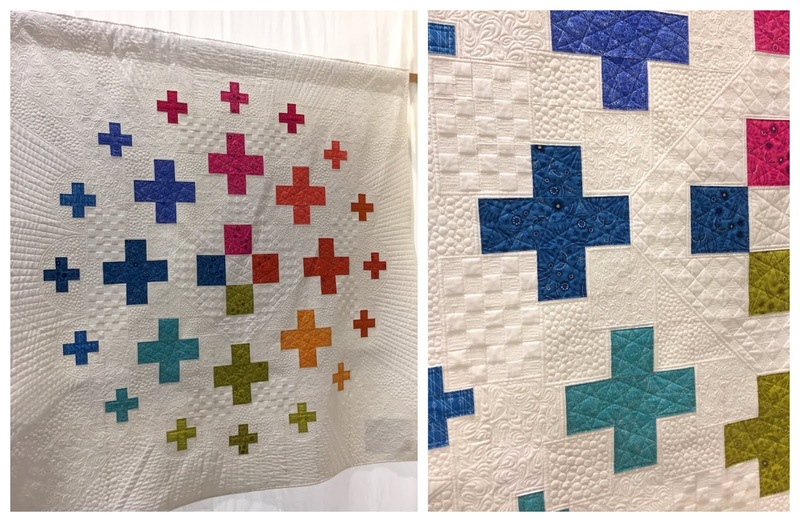 On the Sunday, I had a chance to walk around the show and see some of the quilts - I was very happy to see Abigail of Cut & Alter had an exhibit of her work. I was especially blown away by her On The Plus Side quilt - just look at that amazing ruler work and free motion quilting! And who doesn't love a little Alison Glass, just stunning! 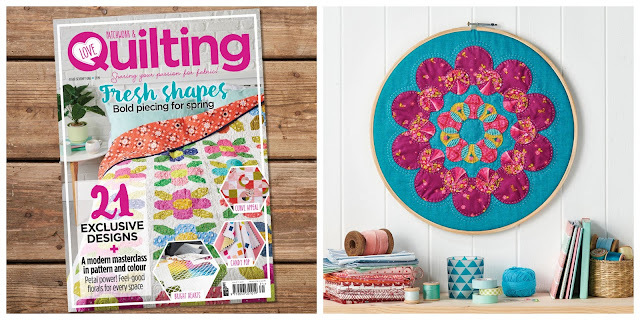 Back to curved EPP for a minute, my Hoop Art project is featured in the current issue (71) of Love Patchwork & Quilting magazine. This hand-pieced flower ring in Alison Glass's Road Trip fabrics is mounted onto a 16" hoop - I do love this way of displaying mini quilts, and must make more! 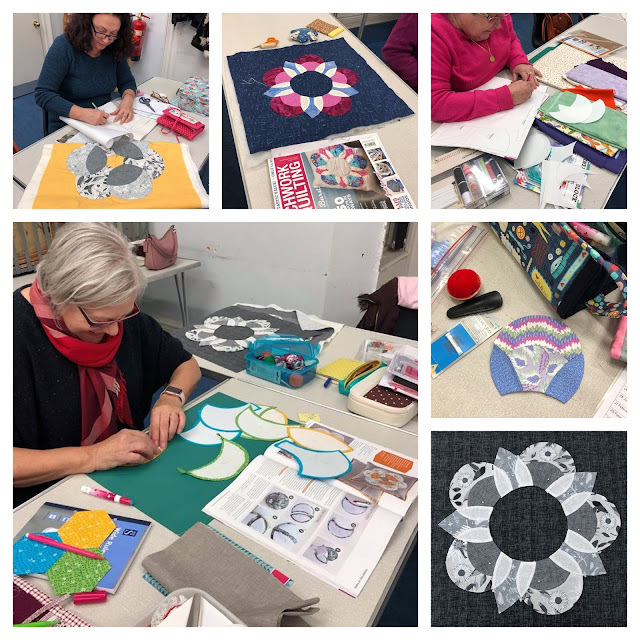 Recently I received a lovely email from a subscriber to tell me how her quilt group had been inspired by my curved English paper-pieced projects in Love Patchwork & Quilting, and British Patchwork & Quilting magazine. So much so that they held a special EPP sewing day to make up my two projects - how chuffed am I?! As you can see, these ladies have a great eye for colour and design, both cushion layouts looking amazing! Thank you so much for sharing your beautiful creations ladies, and I'm so glad I could be your inspiration! 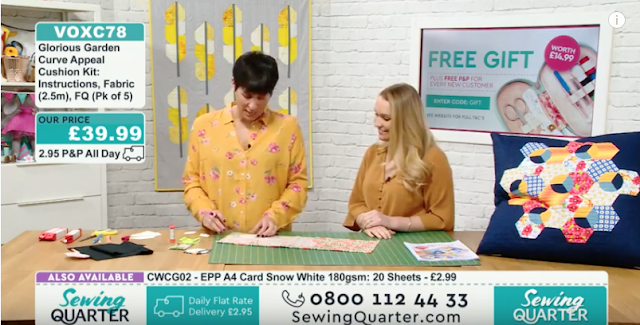 Talking of curved EPP, I had a great time at my second appearance on craft TV channel, Sewing Quarter last week, where I demoed the beautiful Artic Feather quilt by Elizabeth Hartman as well as my Curve Appeal cushions. If you missed the show or would like to watch these techniques again, you can catch them on Sewing Quarter's YouTube channel here - the Feather quilt is in the second hour and my cushions are in the fourth hour. I'm now off to my first quilt show of the year, in the pretty North Yorkshire town of Harrogate. 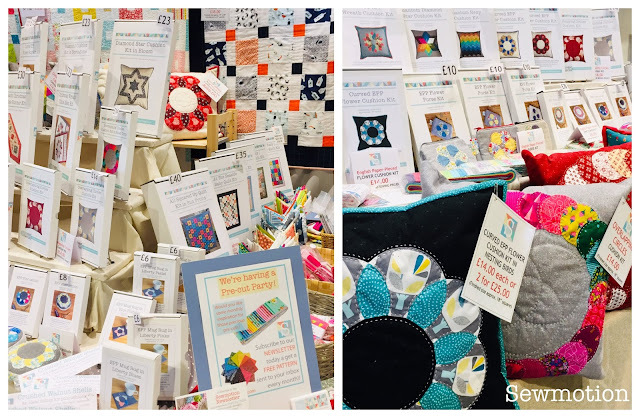 As well as my fabric pre-cuts and patterns, I'll have a huge collection of quilt, cushion and EPP kits, so why not pop along?